Are you an iTunes user? If so then you probably noticed that Windows does not provide much information or integration for Apple's .m4a music files. 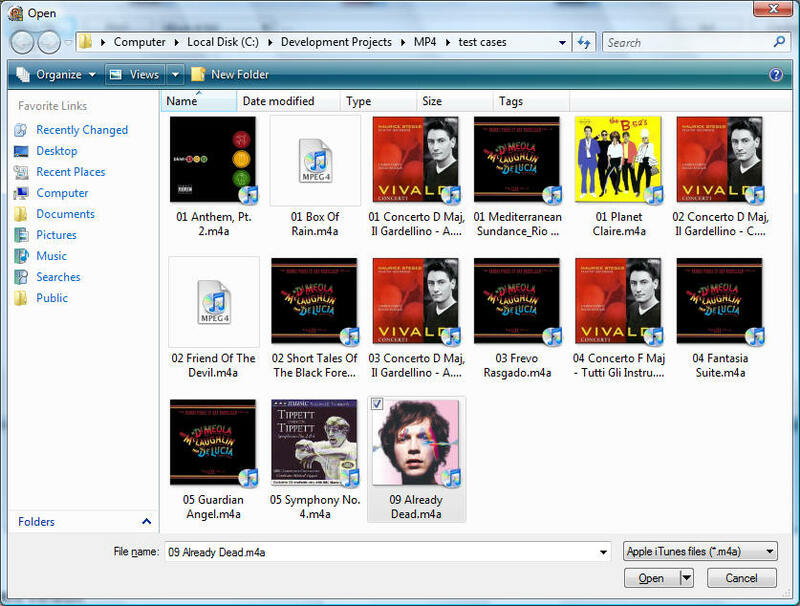 Would you like to see the music file properties for .m4a files in the columns and details pane of Windows Explorer? Would you like to see the Album Artwork in Windows Explorer? 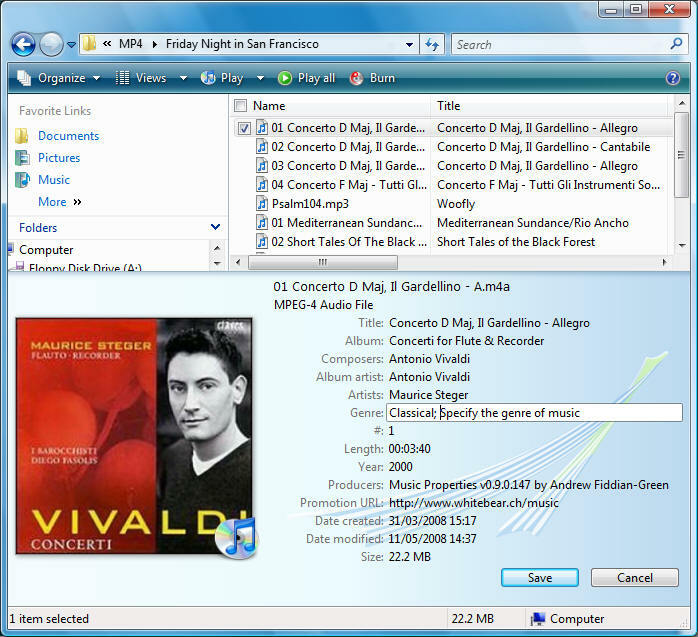 Would you like Windows to provide indexing and searching on your .m4a music file properties? If so, then this is a "Shell Extension" (add in) for Microsoft Windows Explorer that does just that. The current version is v1.0.13.449 dated 2009-04-17 see details below. v0.9.11.377 dated 2008-10-05: registration improved to reduce interference with other apps; correct integer sizes on property writes; more compatibility with XP; added property writing on XP. v0.9.10.287 dated 2008-08-18: added support for Windows XP. v0.9.9.209 dated 2008-07-13: restriction of text properties to 255 characters maximum. v0.9.8.205 dated 2008-06-28: fixed threading model. v0.9.8.203 dated 2008-06-28: fixed Audio Sample Rate with sample rates of 88.2kHz and 96kHz. v0.9.7.187 dated 2008-06-22: fixed Length property; properties Bit rate, Audio Format, Audio Sample Rate, Audio Sample Size added. v0.9.6.179 dated 2008-06-14: always returns determinate values in Out arguments of COM function calls even when exceptions occur. v0.9.5.171 dated 2008-06-10: fine tuning of Windows error codes. v0.9.4.168 dated 2008-06-06: stronger checking against writing of read only properties; 3GPP files are currently handled as read only. v0.9.3.160 dated 2008-06-03: on 64 bit systems Setup creates a Start Menu entry that runs Windows Explorer in 32 bit mode. v0.9.3.160 dated 2008-06-01: thumbnails only created on demand; improved exception handling. v0.9.1.154 dated 2008-05-17: corrected a bug in reading PNG cover art; added more informative Windows error codes. v0.9.0.147 dated 2008-05-11: added the capability for editing properties i.e. no longer just read only properties. v0.7.0.110 dated 2008-04-12: minor fixes to the handling of streams with write attributes, in order to improve stability. v0.6.0.108 dated 2008-04-11: significant improvements in the interface with Windows in order to improve stability. Why does cover art downloaded from Apple iTunes Store not appear in Windows Explorer? Can I use this shell extension on Windows versions prior to Vista? Yes, the shell extension also works on Windows XP, but it does not support the full range of music file properties that are supported on Windows Vista, since some features depend on Windows API functions that were only first introduced in Windows Vista. To see screenshots in Windows XP go here. Can I use use the shell extension on 64-bit versions of Windows Vista? Yes and no. The shell extension is 32 bit code so it cannot run directly under 64 bit Windows Explorer. (For more information see http://support.microsoft.com/kb/895561). However, on 64 bit systems Setup creates a Start Menu entry that will run Windows Explorer in 32 bit mode, as described in the Microsoft Knowledge Base work around. Why can't I find my music file properties using Windows Search? Firstly, you need to ensure that your music file folder is an indexed location. Use Control Panel | System and Maintenance | Indexing Options | Modify | Show All Locations, to add folders to the list of indexed locations. Secondly, after newly installing the shell extension, you may need to tell Windows Search to rebuild its index and thus include the .m4a file properties in the index database. Use Control Panel | System and Maintenance | Indexing Options | Advanced | Index Settings | Rebuild (Re-index selected locations), to start the re-indexing process. What programming language was used to write this Shell Extension? Perhaps I will extend the library to handle other music file types; possible candidates are .mp4, .m4b and .m4v; please inform me if you have a concrete interest in these or other (MPEG-4) file types.